The Hanover Wildcats went 12-0 in 2016 and 13-0 last year. This season, including a forfeit win against Blue Valley Randolph, the Wildcats have delivered another 12-0 mark for 37 consecutive victories. Hanover is on one of the great runs in eight-man football history. From 1985-88, Almena-Northern Valley earned 41 straight victories with coach Chuck Fessenden. That is the only eight-man winning streak of at least 40 games since 1973. The KSHSAA playoff system started in 1969. Scandia captured 41 straight, including titles in ’70, ’71 and ’72, before it lost in the quarterfinals in ’73. Alton enjoyed a 51-game eight-man winning streak that halted in ’68, the best run in the last 60 years, according to a Tuesday conversation with Kansas Sports Hall of Fame director Jordan Poland. Hanover coach Matt Heuer, though, doesn’t feel pressure. The Wildcat alum is 139-25 in his 14th season. The focus very rarely strays from the upcoming contest. This Saturday, Hanover will play Osborne (11-1) in the Eight-Man, Division II state championship game at Newton’s Fischer Field. Start time is 11 a.m. This season marks the fifth straight year Hanover has reached a championship game. The Wildcats lost in the Division I finals in ’14 and ’15 and won in Division II the last two falls. Both squads feature exceptional athleticism and experience at the skill positions, though Hanover has a significant advantage in depth and size. Osborne has had a 12-player roster since Week 2 and routinely plays eight to nine on offense and defense. Hanover lists 24 on the roster, and Heuer said 15 to 16 play “on a fairly regular basis.” Heuer is 4-3 in state games, 4-0 in Division II contests. For Hanover, senior quarterback Daiken Stallbaumer is in his third season as a starter and second year as the starting quarterback. Stallbaumer, like last season, suffered injury that caused him to not play defense. He didn’t play defense for six weeks but is back now. He has thrown for more than 1,000 yards. Like Stallbaumer, senior Carter Bruna is a three-year starter and returning all-state player with more than 1,000 rushing yards. Explosive senior all-purpose threat Thomas Atkins has missed three contests, but Heuer said is healthy for Saturday. Each of the last four years, Hanover has had a key player suffer injury the week before state, not be able to play at state or get hurt at the state game. Osborne has averaged 333 rushing yards a game. Senior Darnell Holloway has thrown for 877 yards with a 14/2 TD/INT ratio. He has rushed 122 times for 1,458 yards and 28 scores. Junior Darrien Holloway has 162 carries for 1,446 yards and 31 TDs. Freshman Mason Schurr has 94 carries for 822 yards and 11 TDs, and senior Kade Miller has 12 scores on 58 offensive touches. Osborne, long-known for its high-flying offenses, won Division I in ’13 and Division I again in ’16. The Bulldogs had coach Steve Tiernan with Cullen Riner as the assistant in ’13. Riner was head coach in ’16. This season, Wise is in his first year as head coach, and Riner is again the assistant. Osborne averages 56.9 points per game. Since the Bulldogs moved to eight-man before the ’10 season, Osborne is 86-17 and has averaged 51.7 points a contest. This year, the Bulldogs have allowed just 17.5 points a game, its best scoring defense of the eight-man era. Osborne opened with an 88-76 victory versus Hill City and then lost 52-20 at Hoxie in Week 2. Since then, the Bulldogs have won every game by the 45-point margin and permitted just 40 combined points in the last seven weeks. This fall, Darnell Holloway moved to defensive end, a position he had never played before. Senior Jordan Wherry, the team’s only player above 200 pounds at 6-foot-5, 270 pounds, starts at center/nose guard. Wherry had never started on defense before. Darrien Holloway shifted from defensive back to linebacker. Junior defensive back Vaughn Stull transferred in from nearby Natoma, which plays six-man football. Schurr is in his first year of high school football. Wise has especially been pleased with Wherry, in his second season of ever playing high school football, along with Stull and junior Steele Wolters. Miller, one of eight-man’s top defensive players, leads with 106 tackles. Wolters has 81 stops and five interceptions. Wherry has collected 73 tackles, and Stull has 46. Hanover features five players at least 205 pounds. The offensive line has featured senior Justin Naegele (6-1, 165) at left end, with senior left guard Cade Cohorst (6-1, 170). Senior Gavin Pralle (6-3, 250) starts at center with junior right guard Jonah Weber (6-4, 250). Senior Pete Peters (6-3, 205) starts at right end. Senior Dayton Shockley (6-3, 230) has played some games at guard. Defensively, Hanover had to replace nose guard Carlos Emanuel, a former classification Defensive Player of the Year. Pralle, Shockley and Weber have switched off at nose guard. Weber mainly played last week in the rematch against No. 2 Axtell. Hanover defeated Axtell, 50-42, in a comeback Week 6 victory. 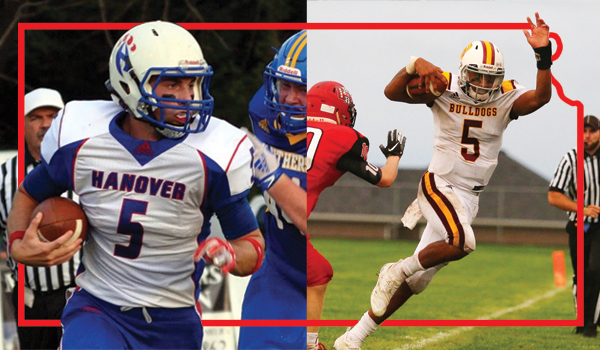 Last week, Hanover won 60-14 at Axtell. “Our kids did a really good job of tightening up once they got around the 20 or the 30-yard line and realizing that the ability for someone to beat us over the top anymore is kind of taken down percentage-wise,” Heuer said. Overall, Peters, Weber, Bruna and Cohorst have been the top defensive players this fall.